The Saudi Aquaculture Society is pleased to present for reviewers this investigation about the importance of aquaculture in Kingdom of Saudi Arabia. The article shall shed light on the most prominent and important merits provided by the sector to the national economy at all aspects whether economic, developmental, or social. Despite the great development achieved by aquaculture sector in KSA during the few last years, it remains a developing sector with regard to production volume, expansion, and effect on economic development of the kingdom. 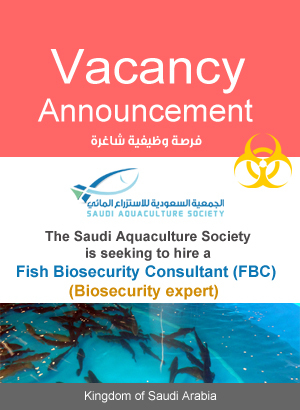 The first steps were taken by studying the reality of fisheries and submitting suggestions related to stat entering aquaculture operations to KSA during the late seventies of the previous century through White Fish Agency which carried on the first researchers about selecting species and potential of setting up aquaculture projects in KSA. This was followed by the agreement between Ministry of Agriculture and Food and Agriculture Organization (FAO) to establish a center specialized in aquaculture researches (Fisheries Research Center in Jeddah previously Fish Farms Center) aiming to nationalize technology and training related to aquaculture as well as studying the economic species and providing technical support for projects. During this period the FRC presented great services to the sector as the center was the main producer and supplier of fish and shrimp cultured species such as white shrimp and barramundi. Shrimp aquaculture sector bloomed commercially by the mid-nineties and expanded by 2009 when KSA became the largest producer of white shrimp in the world with production capacity exceeded 20 thousand tons annually. However, fish aquaculture sector was limited to production of internal water farms with low production from sea water farms. In 2006, KSA a large trade project was launched to produce fish though floating cages with production capacity exceeded 3000 tons. Production has been expanded since 2006 and achieved incredible results to exceed 10 thousand tons per year produced by sea farms of barramundi, bream, and other species. This is accompanied with starting work in one of the largest projects related to fish production in floating cages all over the world by the National Aquaculture Group targeting to reach a production capacity 100 thousand tons when completion. 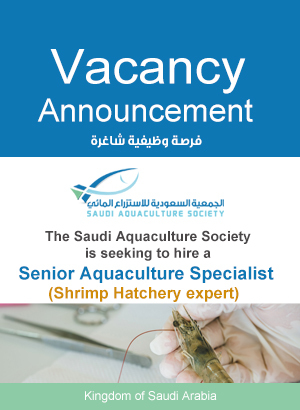 It is expected that in case of approving this strategy to convert aquaculture sector into a real effective industry participating in economic development in KSA through achieving autarky of sea products and reaching 1 million tons capacity by 2029 and providing more than 400 thousand job opportunities for male and female Saudi youth. It is a total plan launched by Agricultural Development Fund and Ministry of Agriculture aiming to create an agency to handle and market fisheries sector products in order to reduce cost and limit competition in the external market, keep high standard of quality allowed in Saudi environment and projects level, and market fishers' products of fishing or aquaculture small projects agreed to be adopted in cooperation with Ministry of Agriculture. The directive teams completed the strategy for activating the sector development. The stagey recommended the concerned authorities to establish an independent program to take over the development of fisheries sector. Fisheries Sector Development Plan focused in providing developmental plans for three sectors related to industry; fishing, aquaculture sector, and sector of handling, preparation, and marketing. In addition, plans were drawn to develop four sectors related directly to fisheries sector; Research & Development Sector, Human Resources & Training Sector, Laws & Regulations Sector, and Financing Sector. The plan determined several quantum objectives including achievement of jobs nationalization not less than 75% of total positions in the sector which are expected to exceed 400 thousand jobs besides providing the largest share of food products to the local market that is expected to be more than 650 thousand tons by the plan completion. Currently, the initiation recommendations are being reviewed by the Supreme Council of Economy. The main importance of aquaculture lies in being one of the significant fields working on providing food for the growing number of population in Kingdom of Saudi Arabia and the related issues such as social and economic aspects and continuous development of certain remote areas in the kingdom. Aquaculture formed an important sector in the world and began to grow day after another along with low supplies of sea fisheries due to overfishing and extinction dangers of certain important species as well as the natural disasters occurred in sea fisheries during the last few years due to high temperature and lack of oxygen. Considering the consumption rate per individual (10 kg/person/year) in Kingdom of Saudi Arabia of sea food, the consumption rate is increasing and supposed to reach the international rate; more than 25 kg per year. According to the steady increase in population witnessed by Saudi Arabia, population number increases about 500 thousand people every year. This means that the expected consumption of sea food shall reach 650 thousand ton/year as revealed by the studies related to the Seventh Initiation. Hence, aquaculture importance is diverse including direct and indirect aspects. Food forms one of the most significant reasons for peoples' development and stability. Kingdom of Saudi Arabia is considered a country with a few water resources which leads to lack of food and depending basically on the imported foods especially meat and fish that form the main source of protein. So, utilizing the coastal areas and shores on the Red Sea and Arab Gulf and benefiting from the public support in investments taking part in achieving food achievement in Kingdom of Saudi Arabia shall be important causes of stability and development in Saudi Arabia. Comparing – even limited comparison- certain products come through local fisheries with those imported from other countries, it is sure that transportation, packaging, and exhibition of such products take longer time than the fresh products coming from aquaculture local projects. In addition, the local products subject to packaging and handling processes according to the highest safety and quality standards. This is noticed well in fish and shrimp in color and textures. The consumer realizes availability of fresher cultured types such as barramundi, bream, and shrimp. In line with the current attitude prevailing in Kingdom of Saudi Arabia as one of the polices adopted by the government during last few years to diversify income sources and pup more investments in new economic outlet to eliminate dependence on oil and its related industries, aquaculture appears as one of the most important options in case of being developed and converted into a real industry participating in development. Most aquaculture projects are in marshes which are often remote from towns and economic and urban activity. So, aquaculture projects may be the only way that works on developing such areas and creating economic and social activities there. Some current aquaculture projects participated in developing small villages and created economic activity as well as job opportunities for citizens such as Laith, Harida, and Mowalih. Aquaculture projects shall provide job opportunities for both male and female Saudi nationals resident in the areas where they are run. According to the study presented by Agricultural Development Fund (seventh initiation), aquaculture projects are able to provide 400 job opportunities for youth of both sexes as manufacturing and preparation projects are allocated for women. There are current examples of preparation factories related to the National Aquaculture Group and Tabuk Fisheries which is under construction. The coming aquaculture strategy adopts strictly keeping the continuity of fresh water production projects and increasing their sufficiency as well as limiting the consumption of fresh water which forms a huge challenge for Saudi Arabia. This shall be carried on through using modern technology and encouraging the conversion to closed systems and recycle water as well as entering several joint cooperation agreements with countries developed in this field such as the Netherlands. In view of aquaculture production as stated in the seventh initiation, KSA having its geographical and environmental potentials can produce about 500 thousand tons per annual of economic marine algae. It is known that algae culturing has great economic and environmental merits especially with regard to their role in eliminating pollutants and producing oxygen and the reelections on climatic changes and high temperature. Recent studies as well as following-up the fisheries statistics produced by Fisheries Agency of Ministry of Agriculture show huge reduction in the production of natural fisheries in the Red Sea and Arab Gulf. This is not limited to KSA but it is an international challenge facing the world as while. In addition, there are many endangered economic species of marine organisms due to overfishing. So, developing industry and achieving high levels of production as suggested in the study shall suffice. In addition, it shall present high quality products and provide the official authorities in the State with flexibility in issuing any resolutions or laws working to protect the natural stock and limit fishing. Furthermore, the development achieved by industry shall help the state allocate research projects participating in studying the endangered species and enhancing the stock through hatching out and breading such species in the research centers besides putting huge amounts of larvae and juveniles in sea water as it is in the countries developed in this field such as Japan. Recently, KSA, represented in Ministry of Agriculture concerned with the sector, began to set up a hatchery in association with Saudi Aramco on the Arab Gulf coast for this purpose. Aquaculture shall paly a positive and vital role in limiting the migration to large towns to look for jobs especially from the coastal villages and rural areas along the kingdom's coasts. These projects shall work on providing job opportunities and good life for residents at such areas. The current experiments proved that the most stable labors in these projects are the citizens of the nearby areas due to being close to their families and communities. In addition, these projects shall play a prominent role in social liability programs towards local communities as such projects shall hold several environmental, entertaining, and educational events for the residents of such areas as well as providing the inhabitants of the surrounding areas with social initiations. Some large projects provided several social events and initiation on the ground that can be a base to depend on in the future. Aquaculture projects, especially the floating cages, are expected to play a supporting role with borders guards sector in controlling and protecting shores and the coastal areas of the kingdom where such projects lie in the sea in unbeaten places which are the vulnerable to penetration and infiltration. As such projects own control system and follow its safety and security procedures, they shall form control and follow-up points of the kingdom's coasts to be reliable in this aspect. No doubt that pumping large investments and constructing several projects on the Saudi coasts shall participate in forming economic movement affecting the national economy. By achieving the aim sought by aquaculture officials, producing one million tons of fish products by 2029, it will result in huge economic movement at the level of logistic services of such projects including transportation, manufacturing, and refrigerating chain, infrastructure, communications, marketing, health services, shipping, and consultancies, etc. This means achieving indirect benefits to national economy due to this huge unutilized industry which shall provide economic revenues and job opportunities for support sectors besides aquaculture farms and projects.